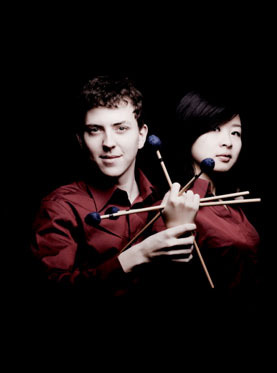 Joint Venture Percussion Duo won the Bernard Haitink Prize during the 2009-2011 edition of the Vriendenkrans Competition of Amsterdam. The duo was awarded a 9-concert tour throughout the premier halls of the Netherlands, including Amsterdam's Concertgebouw and the Muziekgebouw in Eindhoven; furthermore, they were recipients of a scholarship from the Bernard Haitink Fund. Recent performances include tours in China and the Netherlands. In China, Joint Venture played venues such as the Beijing National Centre for the Performing Arts and Shenzhen Symphony Hall, in addition to recitals at numerous conservatories. In the summer of 2010, they were invited by the Luxembourgish Ministry of Culture to perform at the Luxembourg Pavilion of the World Expo in Shanghai. In the Netherlands, Rachel and Laurent were a featured duo in the Big Bang International Percussion Festival playing music from the composer Steve Reich and collaborating with the Brazilian-Dutch choreographer Ederson Xavier. The Duo constantly strives to contribute to the field of contemporary music, and to date have premiered new compositions written for them by Japanese composer Oda Yu, Dutch composer Fred Momotenko and the Luxembourgish composer Pascal Schumacher. Since the Duo's inception in 2007, the collaboration between Joint Venture percussionists Rachel Xi Zhang (China) and Laurent Warnier(Luxembourg) has reflected a blend of cultural and musical influences. Coming from vastly contrasting backgrounds, Zhang and Warnier found common ground through percussion, where they fused their individual ideologies to form the uniquely international duo that they are today. Rachel and Laurent are currently based in Boston.